Rafael Nadal (1) -- Defending and three-time champion is coming off fourth Rogers Cup title in Toronto. Northern California connection: None. Roger Federer (2) -- Shortly after turning 37, looked his age in 6-4, 6-4 loss to Novak Djokovic in Cincinnati final last week. Hasn't won U.S. Open in 10 years after capturing title five straight times. NorCal connection: Beat Jack Sock in March exhibition before sellout crowd of 17,496 at SAP Arena in San Jose. Juan Martin del Potro (3) -- U.S. Open champion in 2009 has rebounded from four wrist operations to reach a career-high No. 3 in world. Has lost to Nadal in last two majors. NorCal connection: As second seed in 2009 SAP Open in San Jose, reached quarterfinals in only tournament appearance. Alexander Zverev (4) -- Considered future Grand Slam champion, 21-year-old German gained first major quarterfinal in French Open in June. Has not advanced past second round of U.S. Open in three appearances. Won Washington title three weeks ago but lost Cincinnati opener. NorCal connection: None. Kevin Anderson (5) -- South African, 6-foot-8 (2.03 meters), has reached two of last four major finals, losing in straight sets to Nadal in 2017 U.S. Open and to Djokovic at Wimbledon last month. NorCal connection: Won 2006 NCAA doubles title at Stanford as Illinois junior. Following year, reached final of $15,000 Futures tournament in Sacramento suburb of Loomis, losing to since-retired Scoville Jenkins. In 2012, advanced to quarterfinals of SAP Open in only San Jose appearance and played part-time for Sacramento Capitals in World TeamTennis. SAP Open and Capitals folded after 2013 season. Novak Djokovic (6) -- Won first Grand Slam title in more than two years at Wimbledon last month and backed it up with Cincinnati crown. Can tie Pete Sampras for third place on all-time list with 14 Grand Slam singles titles. NorCal connection: None. Marin Cilic (7) -- U.S. Open winner in 2014 has reached two of last five major finals, losing to Federer in three sets at Wimbledon last year while hampered by foot blister and in five sets in Australian Open this year. Stunned by No. 82 Guido Pella in second round at Wimbledon last month. NorCal connection: None. John Isner (11) -- American, 6-foot-10 (2.08 meters), reached first major semifinal at Wimbledon at age 33, losing to Anderson 26-24 in fifth set in fourth-longest match in history (six hours, 36 minutes). Has gone 1-3 since winning fifth Atlanta title last month. NorCal connection: Won first pro title in Shingle Springs Futures in Sacramento area in 2007 and reached Chico Futures final in 2006. Ten years ago, advanced to quarterfinals of SAP Open and doubles final of $50,000 Sacramento Challenger with countryman Rajeev Ram. 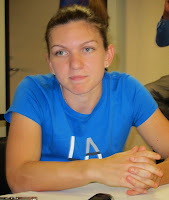 Simona Halep (1) -- Won first Grand Slam title in French Open in June after going 0-3 in major finals. In consecutive weeks this month, captured Montreal title and held championship point in Cincinnati before losing to Kiki Bertens. Lost to Maria Sharapova in first round of last year's U.S. Open after reaching 2016 quarterfinals and 2015 semifinals. NorCal connection: Lost in first round of 2011 Bank of the West Classic at Stanford in only tournament appearance. Caroline Wozniacki (2) -- Two-time U.S. Open runner-up (2009, 2014) won first major crown in Australian Open this year. Has won one match in three tournaments since capturing Eastbourne title on grass in June. Retired from second-round match in Cincinnati with knee injury after receiving first-round bye. NorCal connection: As top seed in 2015 Bank of the West Classic, lost to Varvara Lepchenko in second round after receiving first-round bye in only tournament appearance. Sloane Stephens (3) -- Has reached two of last four major finals, winning U.S. Open nine months after undergoing foot surgery and losing to Halep in French Open after leading by set and early service break. NorCal connection: Fresno product lost in first round at Stanford in 2012 in only tournament appearance. Angelique Kerber (4) -- Has gone 1-2 since winning Wimbledon for third Grand Slam singles title. Won Australian Open and U.S. Open and advanced to Wimbledon final in 2016 before inevitable letdown last year. NorCal connection: Won Bank of the West Classic in 2015 and advanced to 2014 final. Garbine Muguruza (12) -- Two-time Grand Slam singles champion, 24, has never advanced past fourth round of U.S. Open. Lost Cincinnati opener in only tournament since losing to No. 47 Alison Van Uytvanck in second round at Wimbledon. NorCal connection: As top seed in inaugural Mubadala Silicon Valley Classic in San Jose, right-hander withdrew with right arm injury hours before Aug. 1 opener. In her only two Stanford appearances, reached singles semifinals last year and quarterfinals in 2014 and won 2014 doubles title with fellow Spaniard Carla Suarez Navarro. Kiki Bertens (13) -- Dutchwoman, 26, has gone 8-0 against top-10 players on grass and hardcourts this summer. Hardcourt final in Cincinnati was first for former clay-court specialist. NorCal connection: In only Bank of the West appearance, lost to wild card Nicole Gibbs in first round in 2013. Gibbs had just turned pro after winning her second consecutive NCAA singles title as a Stanford junior. Madison Keys (14) -- Succumbed to nerves in first major final, losing to Stephens 6-3, 6-0 in 61 minutes in last year's U.S. Open. Advanced to Cincinnati quarterfinals, upsetting Kerber, in only tournament since losing to qualifier Evgeniya Rodina, ranked No. 120, in third round at Wimbledon last month. NorCal connection: As second seed in Mubadala Silicon Valley Classic, right-hander withdrew with right wrist injury shortly before Aug. 2 opener. Won 2017 Bank of the West Classic before tournament moved to San Jose under new sponsor. Serena Williams (17) -- Can tie Margaret Court's record of 24 Grand Slam singles titles. Seeks sixth U.S. Open crown but first since 2014. NorCal connection: Lives in San Francisco with husband Alexis Ohanian, co-founder of social news website Reddit, and daughter Olympia, who will turn 1 on Sept. 1. Distracted by parole of sister's killer, suffered worst loss of her career -- 6-1, 6-0 in 51 minutes to Johanna Konta -- in first round of Mubadala Silicon Valley Classic on July 31. Won Bank of the West Classic in 2011, 2012 and 2014.